Posted on December 10, 2012, in A Virgin a Day, Atotonilco, Blue Monday, Guanajuato, Mexico, Recuerda Mi Corazon, senryu. Bookmark the permalink. 23 Comments. What beautiful tile work of blue. Thanks for sharing. You are quite the traveler! What an interesting piece of art-those heads serving as a border are ‘different’! But I love the image and also find myself getting fixed on the background swirls too. What a visual feast! beautiful tile work. Sorry about re-posting my comment, for some reason I keep losing it. Love your Haiku and of course Mary is always beautiful. Thak you. Very interesting piece of art. I like it a lot. This is a joyful piece! I always wondered why they called Gabriel a handmaid and then the patriarchal church tried to insist the Angel was male. But maybe i am ultra-sensitive…things I just thought about while I was bored during mass when I was a kid. Yes, Lisa — she’s the Angel Gabrielle. 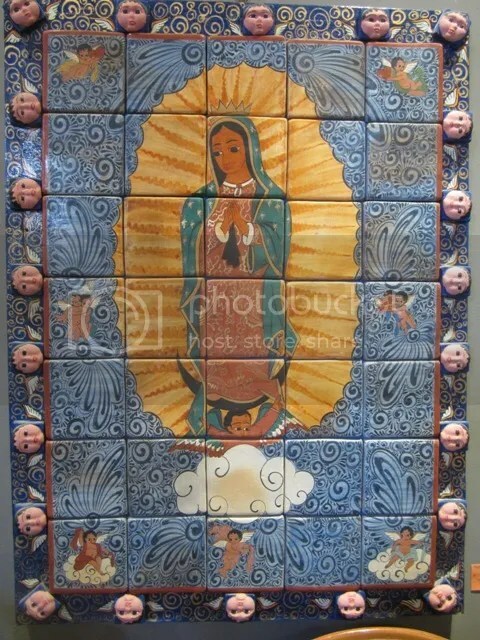 And this tile work is fabulous, not only for its depiction of Our Lady, but for the little three-dimensional figures of cherubs bordering the tile work. So precious and so powerful! So very beautiful with perfect haiku to match. This Mary looks gentle and innocent……..and I just love those angels! I just put out my Mexican Nativity Scene. Beautiful! yes…those lovely cherub faces all around! humble, such a lovely attribute of inner beauty.